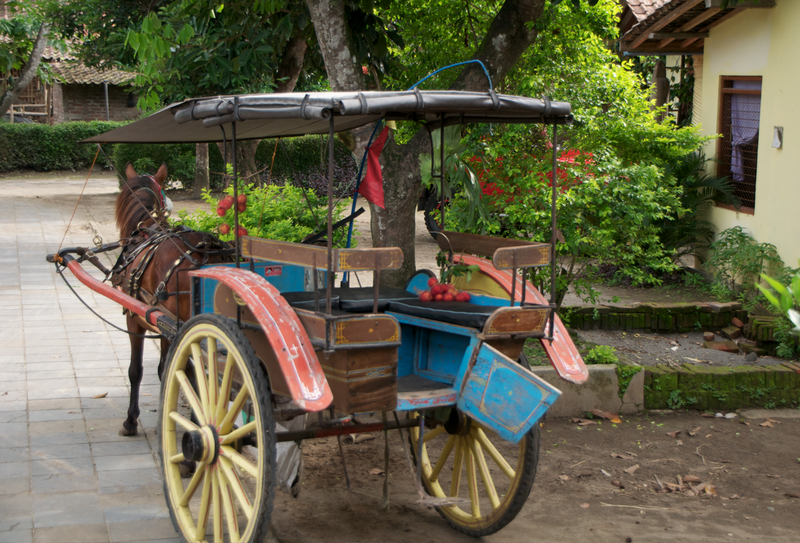 Indonesia - Jogja ~ Learn, Live, and Explore! For my first time in Indonesia, I decided to visit Jogjakarta (more commonly called Jogja, also spelled Yogyakarta) and Bali. Jogja is considered the cultural heart of Java and is home to the popular UNESCO world heritage site - Borobudur. Bali, of course, was a no brainer decision to add to the itinerary after reading/seeing "Eat, Pray, Love", right? More on Bali in my next blog entry, though. The planning for this trip was very simple. I used a travel company I had worked with the last time I came to Southeast Asia - Exotissimo. When I first discovered their site online in 2008 and got a price quote, I thought it was too good to be true. The quote I got was around the price you would expect for an average Caribbean cruise, without airfare, but you get the luxury and flexibility of a private guide and driver, plus accommodations, activities and entry fees, and some meals! The whole experience was so great that there was no doubt in my mind I would be using them again for Indonesia. While the planning was easy, getting to Jogja was nothing short of a miracle, thanks to the Jakarta airport staff. My flight from Kuala Lumpur was delayed, shortening my time between flights, including visa and customs, from 2 hours to 45 minutes! But the staff were alerted by KL airport staff, and were waiting to whisk me through customs, take care of my bag, and guide me to my next gate with time to spare to catch my breath and wipe my brow (several times). 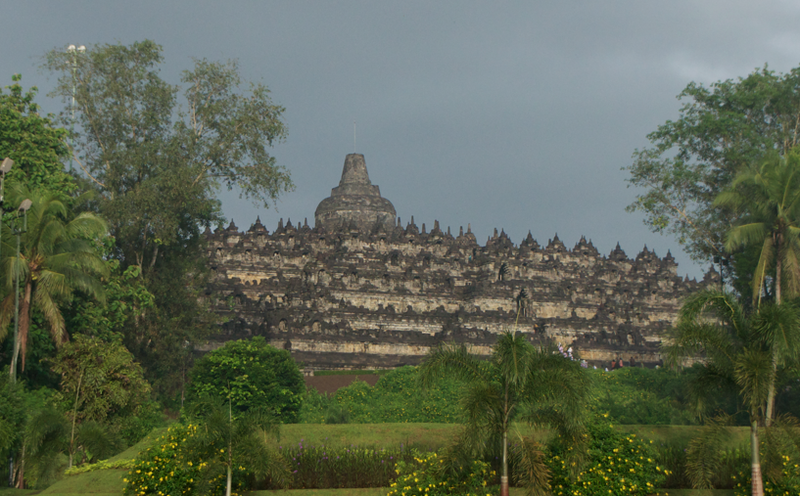 After a good night's rest, it was time to tour parts of Jogja and make our way to the Borobudur area. First, we stopped at the Sultan's Palace. 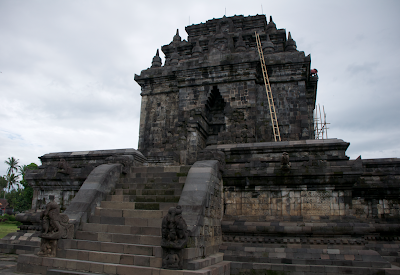 While this is considered a must see attraction in Jogja, it was not much of anything, in my opinion. The buildings were unimpressive, like a run down set from The Music Man or Mary Poppins, and half of the tour was devoted to a museum for the father of the current Sultan, who died in the 1980s. The weirdest part of the visit was getting asked by several people who wanted to take a photo with me. Apparently, being a blond haired, blue eyed foreigner in Indonesia, Java especially, instantly elevates you to celebrity status! 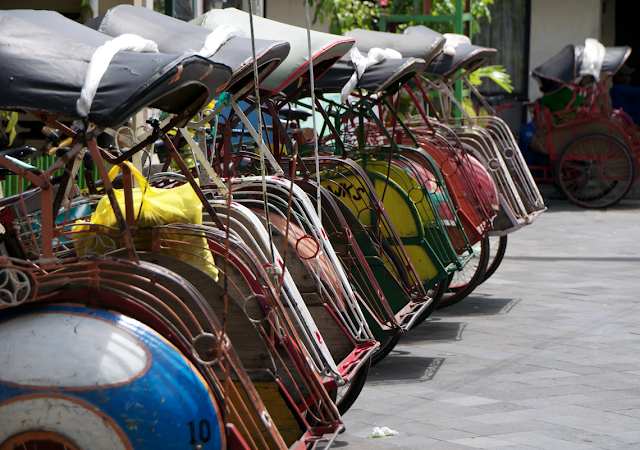 I was informed the majority of annual visitors to Jogja are from Jakarta and surrounding areas. The next stop was the Water Palace. Formerly a grand sight, now all that remains are two gateways, outer buildings that have been restored, and the ruins of the palace itself. The water that once surrounded the palace has since been filled in and replaced by a neighborhood of homes. The restored area is nice, but there is not much to see, just the buildings themselves. 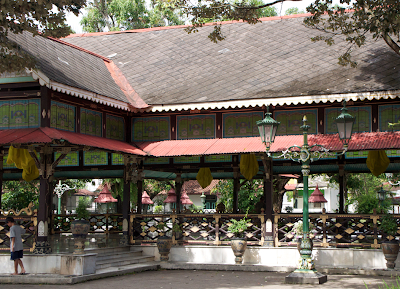 Our exit from the palace led us through a nice Jogja neighborhood, where we saw a man painting shadow puppets. These puppets, used for wayang kulit, are a tradition in Central Java and are made from buffalo rawhide and bones. The detailing is very intricate in order to create dazzling designs when projected on the screen. For tourists, the puppets are painted for display puposes. Next, we began our journey to Borobudur, by way of two temples and small village. The first temple is a small buddhist temple called Candi Mendut. If you make the climb up the steps, you will be greeted by a Buddha statue sculpted in an Afghan style with its hands positioned in the nirvana pose. The Buddha is flanked by two angels. At this temple, yet again, I was asked to take a photo with a family. I also discovered the secret weapon against persistent vendors! While normally foreign tourists would keep walking and say "no thanks!," being polite, I made it a point to learn "thank you very much" in the local dialect, which is not Indonesian as one may believe (terima kasih, said tah-reem-ah kah-see), but Javanese - matur nuwun (said mat-tour new-woon). When I said that, the girl ran away to tell her friend. My guide said that I shocked her by speaking in Javanese! This has worked in other places as well....everyone does a double take because the words are so unexpected from a foreigner! 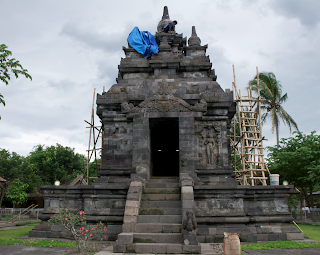 The next temple we visited was Candi Powan, a smaller version of Mendut that was under restoration. Our last stop of the day was to a small village of just over 4,000 people called Candirejo. To supplement the village income from farming, the younger generation devised a way to bring tourism to the town by offering an eco-tour. Our guide for the day was Wiwik, and our transportation...one crazy little horse attached to small cart. Boy was I in for the ride of my life - like Disney's Big Thunder Mountain Railroad!! The idea of the tour is to expose visitors to the village way of life, their everyday activites, and their sustainable farming techniques. Our first stop was to observe the building of a cow pen and digging of a well. The villagers showed us how, while digging the well, they found very small gold specks in the soil, but not enough to make it worthwhile to sieve out. We also observed farmers using intertubes to transport tools across the river to where additional farms were located and spoke to local women who were suprised when I responded to their question about my age -- they thought I was 16 to 20 years old! YES! Fooled them! After this visit, we rode to another part of the village to observe the process of producing cassava root crisps. Wiwik showed me how they peel the skin off he root, grind it up into a fine powder, sift the powder, steam it until it has the consistency of a soft bread, then run it through a pasta crank before shaping them into rings that are deep fried. 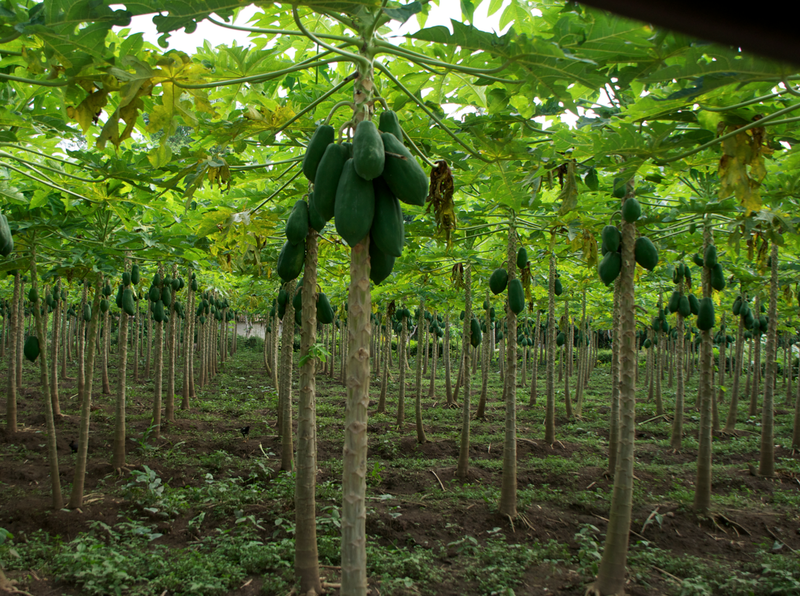 Cassava is a plant that is very easy to grow and reproduce, and it not only gives the village a source for carbohydrates but the water squeezed out during the crisp making process also serves as a good fertilizer. 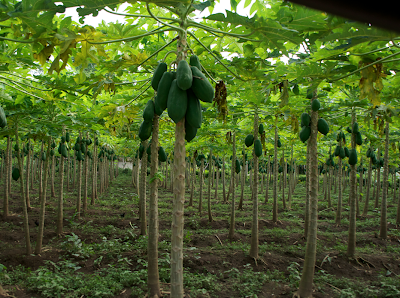 Cassava root is also commonly used for tapioca. Our last leg of the tour included a stop at a traditional Javanese home for tea and snacks and to a field to demonstrate co-cropping technques using plants with complementary growing styles - like corn, chili, cassava, and peanuts. At the end of the tour, I was left with the thought of how silly my life is with all of the material things I feel I need to own, meanwhile this village is filled with happy, supportive, and cooperative people devising ingenious ways to promote the continued sustainment of their villiage and its way of life. Sometimes, simplicity can be just as good as complexity in life. The next morning, I received an early wake up, well not as early as the local Imam and his 4am call to prayer singing over loudspeakers (I don't think I could ever live in a muslim country because I am NOT a morning person!). 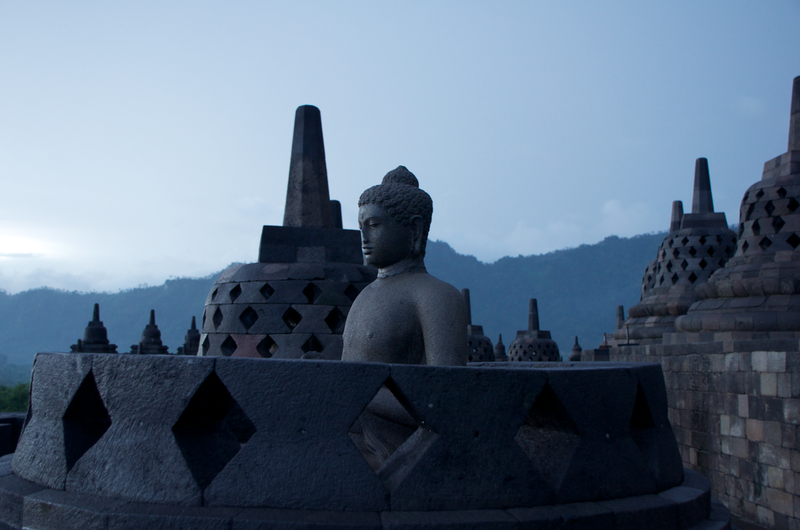 My early wake up was for the 5am sunrise entrance to Borobudur. 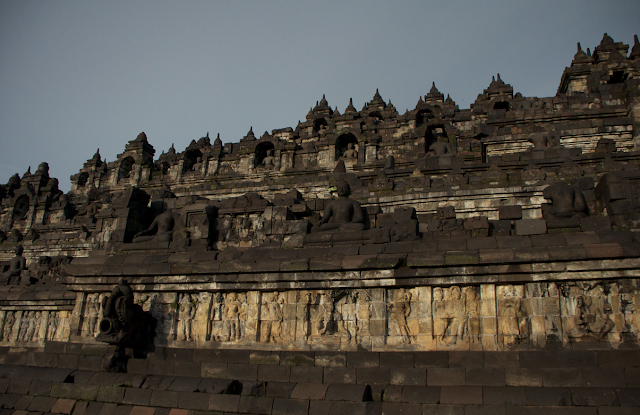 Built in 780 AD, Borobudur is the largest buddhist temple in Indonesia. 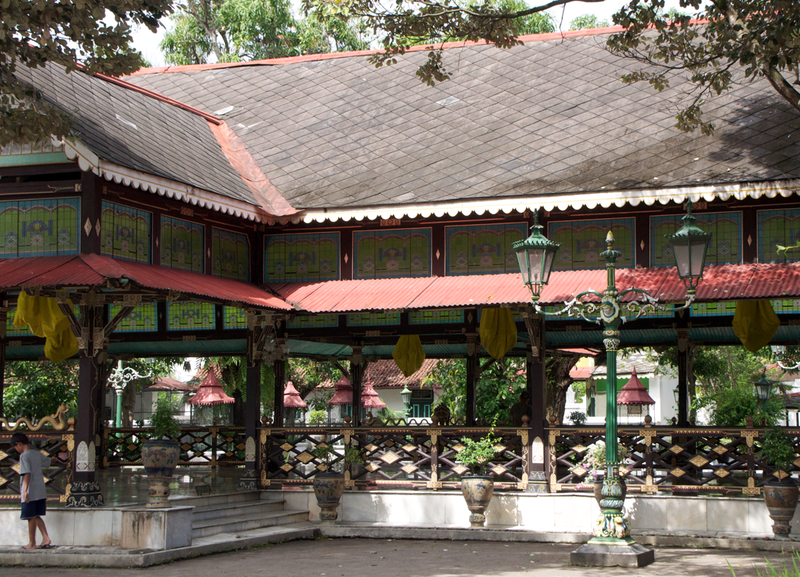 It has survived and been restored after many earthquakes and volcano eruptions from Marapi nearby. The temple has 10 levels, one for each step to nirvana: Level 1 is Hell, Levels 2-5 mark the move from Earth into Heaven and reasoning/thinking (Level 5), and Levels 6-10 are the stages of Nirvana, or enlightenment. 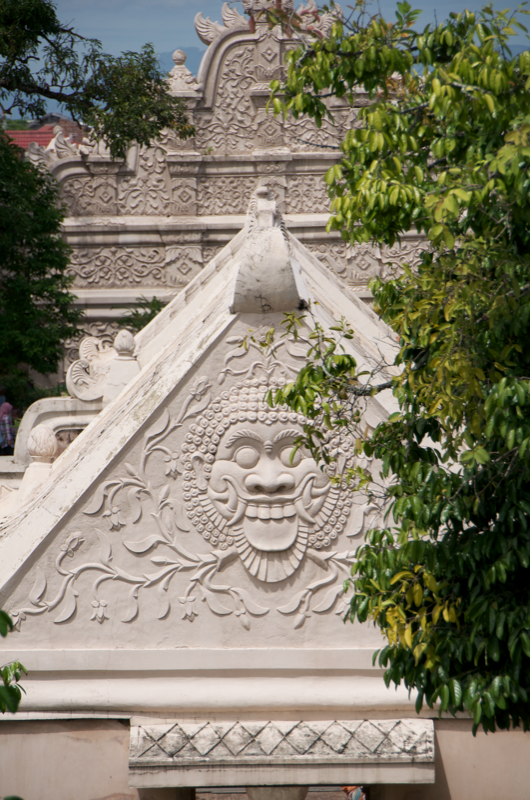 Along the facade of each level is a stone carving that tells a story as it wraps around the temple. We explored the 2nd, or Earth, level and its carved portrayal of the Buddah's birth and life - from princehood to enlightenment. At the top level, nivana, there are 72 stupas that contain statues of the Buddha with his hands in the nirvana pose. Buddha statues on other levels have his hands positioned in other ways, according to my guide, east side demonstrating testimony, west meditation, south charity, and north peace. Once we finished our tour of Borobudur, we headed back into Jogja to visit its third "must-see" attraction - Prambanan. This is a very large hindu temple grouping built in 856 AD similar to the Angkor and Roulos temple groups in Siem Reap, Cambodia. 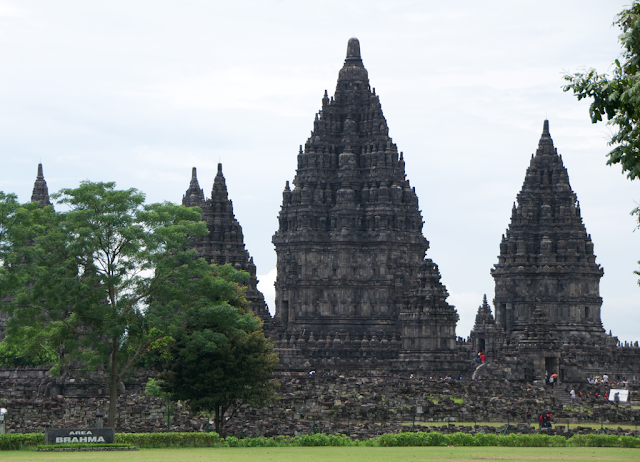 Prambanan has three large temples on the top level - one for each of the three gods. The tallest temple in the center is devoted to Shiva - god of destruction. It is believed that Shiva got a larger temple to appease him due to the 300 volcanos in the Indonesian archipelago, as well as the fact that he is the god of fertility (for crops and people). On the left is the temple to Brahma, and on the right is the temple to Vishnu. Directly in front of these temples are temples to the God's respective animals - swan for Brahma, a bull for Shiva, and Garuda the eagle for Vishnu. After Prambanan, the final activity during this whirlwind two day tour was to learn how to craft traditional Javanese batik, the art of dyeing designs on fabric using wax drawing tools and stamps to control the application of the dye. 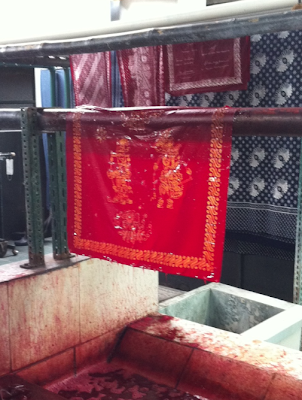 Read about this in a later blog I plan to write on the batik process.